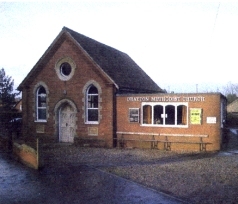 A small church with a congregation of 15 to 20, fully handicap accessible, with Sunday services especially accommodating adults with learning disabilities. Services: Sunday at 10.30 a.m.
Holy Communion is on the fourth Sunday of the month. Traidcraft: After service on the fourth Sunday of the month there is a Traidcraft stall selling a wide variety of fairly traided products. Thursday: Ecumenical Fellowship on the 2nd and 4th Thursday at 2.30 p.m. The Church building is carpeted and centrally heated. Our rooms are available to be hired by non-church organisations and would be suitable for a wedding with up to forty guests. Please note that no alcohol is permitted on the premises. Please contact Katie Finlayson on 01603 423440.